Kihei is located on Maui's sunny southwestern shore with six miles of beautiful beaches and close access to shopping and dining. This coastline provides impressive offshore views of two other Hawaiian Islands, Lanai and Kahoolawe, as well as Molokini Islet and the rolling mountain landscapes of West Maui. A day at the beach is an essential item on the itinerary when visiting Kihei. You have many to choose from and one of the best for snorkeling is Kamaole Beach Park III. Other fun activities include kayaking, bodyboarding and surfing. Whale watching is good here during the winter months. Bird lovers will enjoy a visit to the Kealia Pond National Wildlife Refuge where you can see stilts, coots, night herons and other Hawaiian birds that feed and nest in the historic fishponds. For more ocean fun head over to Maalaea Harbor to go on a snorkeling excursion to Molokini Crater, charter fishing or whale watching during the winter months. Cruises also embark from the Kihei Boat Ramp. Maalaea Harbor is also home to the Maui Ocean Center with an interesting Whale Discovery Center and an impressive Living Reef exhibit with a Turtle Lagoon, Sting Ray Cove and touch pool. A highlight of the Maui Ocean Center is the clear acrylic tunnel aquarium that surrounds you with fascinating and colorful marine life. Kihei has a public golf course and you can find immaculate championship golf courses to the south in Wailea and Makena where you will also find more beautiful beaches. Maui is not a large island so you can enjoy day trips to various attractions including the summit of Haleakala Volcano and the road to "Heavenly Hana." Kihei's three main beaches are called Kamaole Beach Park I, II, and III. They all have facilities, lifeguards and nice offshore views of Kahoolawe and Lanai as well as Moolkini Islet and northwest Maui. 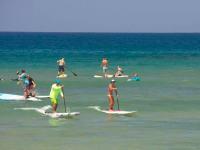 The largest of the three beaches is Kam I and is a great place to take a surfing lesson. A grass park borders Kam II making it nice for picnics. Another nice Kihei beach is Kalama Beach Park with grass areas and palm trees making it a popular spot for local events including music concerts and craft fairs. There are also basketball courts and a playground for kids. Some of Hawaii's finest beaches can also be found to the south including Wailea Beach and Makena Beach. Kihei has many restaurants to choose from including casual fare and upscale dining. There is also nightlife including dance clubs, sports bars and even karaoke. Several resorts offer Polynesian-style luau dinners featuring music and dancing as well as a buffet dinner. Kihei also has numerous grocery stores where you can stock up on supplies. 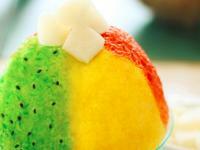 More great restaurant choices can be found to the south in Wailea or north in Lahaina town. Kihei is home to about a dozen shopping malls including the Piilani Village Shopping Center where you can find lots of Hawaiian gifts at the Hilo Hattie store. Azeka Place is Kihei's largest shopping center with more than 50 merchants. Drive south to Wailea or north to Maalaea and Lahaina town for more shopping opportunities. Renting a car is recommended when staying in Kihei so you can explore nearby beaches and attractions as well as other Maui sights including Haleakala National Park and the road to "Heavenly Hana. 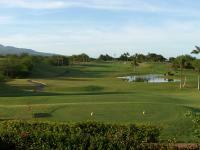 "Kihei is about 12 miles from Kahului Airport. Maui's public bus system operates 7 days a week and provides service between most major communities including West, South and Central Maui including the Upcountry region. Expect sunny weather in Kihei. Maui's western shore is known for its year-round great weather with lots of sunshine, moderate rain and comfortable temperatures that are usually in the 70s and 80s. Winter temperatures may dip into the 60s and summer temperatures may rise into the 90s on the hottest of days. Tropical trade winds provide a comfortable cooling effect, often. Kihei beaches are typically very calm with glassy conditions in the morning hours, though during the midday and afternoons the trade winds may blow quite strong. Like all Hawaii beaches, conditions can change and you should always use caution before entering the ocean. Inexperienced swimmers are advised to always swim and enjoy ocean activities at lifeguarded beaches. Check with lifeguards before going in the water to learn about the safest areas to swim and enjoy the water activities you choose. 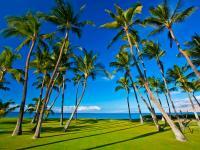 Our Kihei vacation rentals offer luxury and relaxation in one of Maui's most desired vacation destinations. From beachfront homes to condos in premier resort locations, we have Kihei area accommodations to suit your needs. Kihei vacation homes provide the optimal way to enjoy your Hawaii vacation with all the luxuries of resort living and also the comforts of home. Browse through our Kihei vacation rental listings to get an understanding of the different amenities and property features we offer. Our goal is to provide you with a with an unforgettable Kihei accommodation for your dream Hawaii vacation. We take pride not just in having the largest selection of high-quality vacation rentals in Kihei, but also in the fact that we stand behind our product and make sure only the best of the best Kihei properties are listed on our site. If you have questions about our Kihei rentals or which destination is best for your vacation needs, please give us a call and we will be happy to assist you. In ancient times the Kihei area was home to many Hawaiians who lived in small villages, fished the sea and maintained shoreline fishponds. A sugarcane plantation was started in Kihei in the early 1900s but ended in failure due to lack of water for the thirsty crop. The Kihei region remained sparsely populated until the 1960s when water from Central and West Maui was piped to Kihei making the area attractive to developers as a tourist destination. Today Kihei is a bustling Maui beach town providing many vacation accommodation options than may be more affordable than resort areas to the north and south.